Today we have something a little different in our blog. 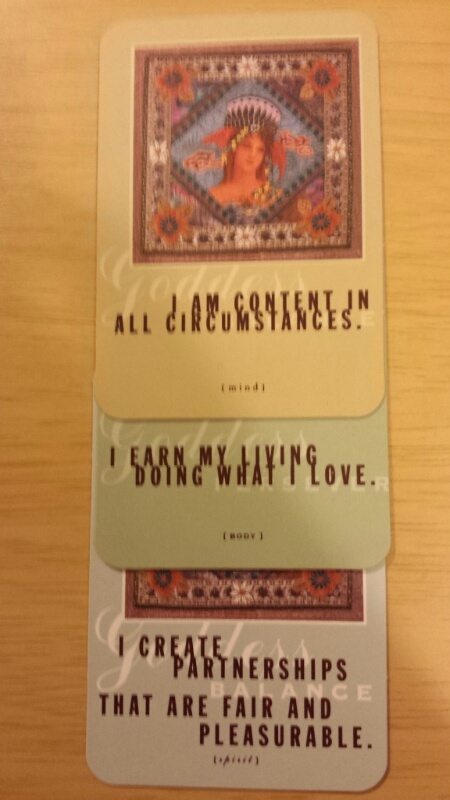 We’ve got a reading from the Gifts of the Goddess affirmation cards, and today I was guided to pick 3 – instead of 1 as I usually do. Use this gift whenever you notice that you are discontent with the way things are. Try believing that things are the way they are for a reason you do not yet know. It may not be possible to maintain this belief at all times, but strive to return to this state whenever you are feeling this content. Use this gift when you feel unfulfilled by your present manner of employment. You created your present work situation and you can create a better one too. Take on work that nurtures your mind, body, and spirit and that of others. Whatever you do for a living, you can use your creativity to do it. Make your life a work of art and your are of work of life. Our last card for today, is for the spirit. Use this gift when you are lonely or when existing relationships are unsatisfying. Partners you bring into your life are manifestations of your own needs for growth and completion. If your relationships are aggressive and defensive, you will manifest that in your daily life – try to focus on being open and receptive instead. So do any of these cards resonate with you, your spirit or with your energy? Sometimes only a small part of a message is relevant to us. Sometimes there is nothing that we can relate to in a card. Sometimes the message for us is just a single word from the whole reading. But we all want to earn a living doing what we love. We all want to be content and fulfilled and happy. Perhaps we all want partnerships that are fair & beneficial to all parties. How do you envision your life doing the things that you love to do, being content and having beneficial friendships/ partnerships/relationships. What does it mean to you I wonder? Let’s help each other to grow. Let’s discuss! You can also hear an affirmation in the podcast via the ipadio link at the bottom of this blog post. This entry was posted in Abundance, Inspirational, Motivational, Oracle/Colour/Angel card readings, Positive Affirmations, Spiritual and tagged balance, balanced life, believe, Goddess cards, perservere, positive affirmations, self confidence, self growth, trending blogs. Bookmark the permalink.